My early conception of Permutations was as a tool through which to explore six-part counterpoint, imagining the violin parts as six equal, interwoven contrapuntal lines. The idea of being able to physically walk through the fabric of the music, and single out each thread individually was an exciting motivating factor for me. While this is still a large part of it, the entire piece will not consist of constant polyphony. Listening to some of the great feats of counterpoint from history, I began examining Beethoven’s Grosse Fuge in some detail. I noticed that the intervals between the notes in the fugal subject are a palindrome. One of the notes that can be seen sketched on Finbarr and Andrew’s very first sketch of Permutations is ‘repetition : sublime’. Andrew wrote the note after reading parts of Edmund Burke’s ‘On the Sublime and Beautiful’, in which Burke writes the repeating visual elements create an imaginary infinite space, evoking a sense of the sublime. The reflection of these ideas in Beethoven’s powerful fugal subject led me start playing around with the palindrome, exchanging the intervals while keeping the pattern constant. I enjoyed the way the patterns sounded somehow familiar and unexpected at once, and so began to use them for my sketches. At this point, I explained the palindrome in the fugal subject and how I had used the pattern to create my own palindromes to Finbarr and Andrew. 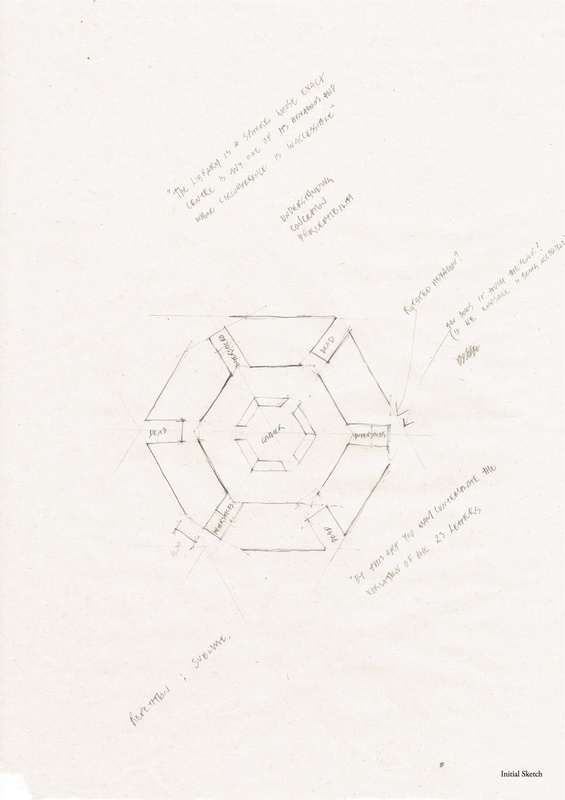 They then became interested in the idea of using the palindromic structure to inform the architectural proposal in a direct way, by purposefully designing a visual rhythm in the chamber linings.